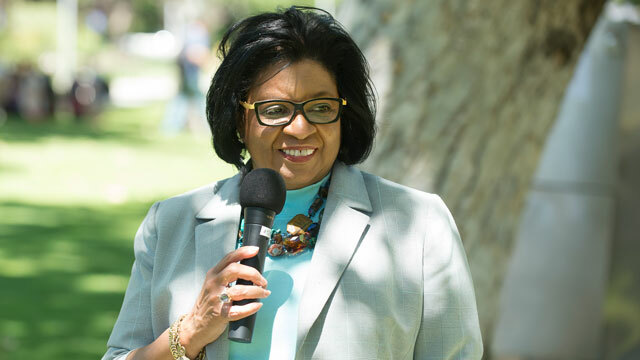 President Coley addresses student questions at a Pizza with the Presidents event. The first quarterly Pizza with the Presidents event of the 2015-16 academic year will be held Nov. 10 in the Bronco Student Center, Ursa Major, from noon to 1 p.m. The hourlong Q&A session will give students the chance to have a free pizza lunch while asking questions of and sharing their concerns with President Soraya M. Coley and Associated Students Inc. President Julian Herrera, along with other campus administrators. Students wanting to participate can do so by filling out a comment/question card at the event, or by contacting the university through Facebook or Twitter. The @calpolypomona account will be tweeting answers in real time throughout the event. Be sure to follow @calpolypomona, #askColey and #askASI on Twitter. The event is hosted by the Office of the President and ASI. For more information, call (909) 869-3342.